Legal Muscle, by Rick Collins J.D., shatters the myths and misconceptions about steroid use in America. 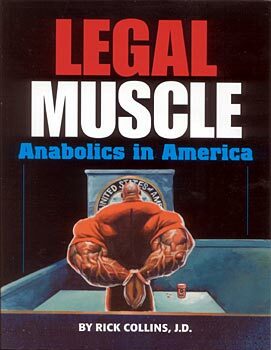 Authored by the nationally recognized legal authority on anabolics and fonder of www.SteroidLaw.com, it's essential reading for natural and "juiced" athletes alike, and for coaches, sports trainers, physicians, journalists and anyone in the criminal justice system. Legal Muscle is the never-before-told truth! "People have rights, and for the most part, they have no idea what they are. This is the book you better damn well have read when the door flies off the hinges." Before you even think about using steroids, read this book! "No one knows more about the legal aspects of anabolic steroids than Rick Collins." The value of a $2,500 consultation for less than fifty bucks! "If you are a steroid user, or are considering using steroids, then stop what you are doing and get this book right away. Rick Collins is the Johnnie Cochran of steroids."